A few weeks ago Nokia’s upcoming Android Nougat smartphones leaked in images, giving us a glimpse of what we could expect to see next year. Nokia’s return to smartphones has been highly anticipated by fans all over the globe and now the company has confirmed that new handsets are actually slated for 2017. The information popped up in a presentation showcased at the Capital Markets Day event Nokia holds for investors. 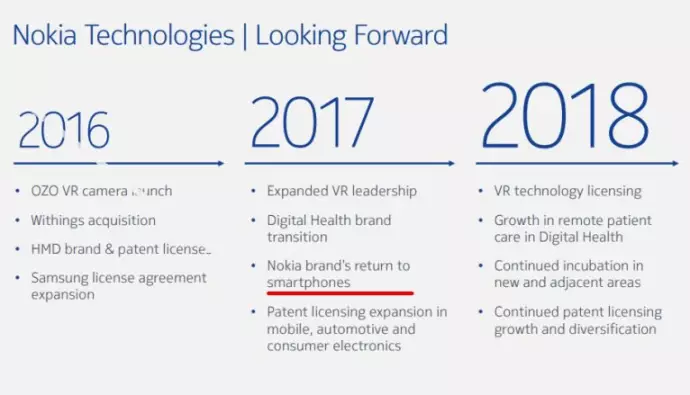 As you can see for yourself 2017 marks “Nokia brand’s return to smartphones”. After the Microsoft acquisition, Nokia stopped producing smartphones. The upcoming 2017 devices aren’t going to be manufactured by the Finnish company either, but rather by HDM Global (a Finnish manufacturer) in collaboration with Foxconn. The slides also reveal that HMD has a ten-year exclusive agreement in place with Nokia for using its brand on mobile phones. The former company will be investing a minimum of $531 million into advertisement for these smartphone products. If previous leaks are to be believed, Nokia is prepping an all-metal flagship with Gold, Black and White color variants. These days mobile phone makers tend to release flagship in pairs. Just look at Apple (iPhone 7s and iPhone 7s Plus), Google (Pixel and Pixel XL) or Samsung (Galaxy S7 and Galaxy S7 edge), so Nokia will follow the trend. We’re told the phone maker will unveil a 5.2-inch and 5.5-inch model in 2017. As for computing power, the upcoming devices are expected to run on a Snapdragon 820 chipset, but given that the next-gen Snapdragon 835 is said to be making it out into consumer devices in 2017, we might as well see Nokia’s new flagships take advantage of the 10nm FinFET chips. Not much is known about resolution, but we’re guessing that at least one model (probably the larger) will enjoy QHD res (1440 x 2560). Other rumored specifications include IP68 certification for water and dust resistance, fingerprint scanner (embedded in home launcher) and a revamped Z Launcher. Nokia’s return to the smartphone maker is said to happen in early 2017. Which means that the phones might see the light of day at MWC 2017 in Barcelona. We’ll just have to wait and see. All India Blogging is your one-stop destination to discover things that will amuse you, thrill you and entertain you. LeEco + Coolpad (Full Specs) phone to be Launched Soon.